ASU Herberger Institute: "The Pyracantha Press was established at Arizona State University in 1982 as the production and research imprint of the ASU Herberger Institute School of Art's book arts program. The press undertakes book arts projects that have particular merit in literary content, result in visual or technical research or provide for significant collaboration between writers and artists or between artists. Publications of the press are not done as class projects, but are produced with professional care and quality by the director, the staff printer and graduate research assistants." Tempe, Arizona: Pyracantha Press, 2014. Edition of 100. 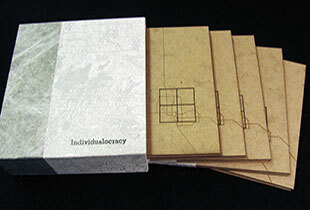 2 x 6 x 6" slipcase containing five books, four with Turkish mapfold structure and one bound book (36 pages). Digital, polymer, and letterpress printed on Mohawk Superfine i-Tone. Typeface is Stymie with Rockwell heads. Covers laser cut. 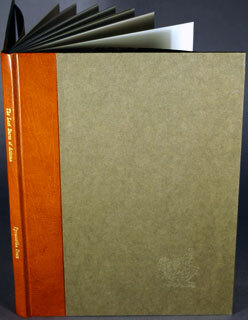 Bound with hand-tinted Tyvek spines and printed covers. Slipcase wrapper and Book E endsheets printed from polymer plates. Signed and numbered on the colophon. Pyracantha Press: "Collaborative artist's book researching the role of the individual that contributes to urban sprawl using metropolitan Phoenix as the laboratory. Five books in a handmade slip-box, four books are a Turkish mapfold structure and when combined together make up metropolitan Phoenix. The fifth book contains research data." Matthew Salinger: "[The project] involves research organized around attempting to understand how people directly control their surrounding urban environments through personal everyday decisions such as where to dine, shop, live, and be entertained. Our team collected over 100 lengthy interviews in person from people all over the Metropolitan Phoenix area. The data shows a stark difference of the way people live depending on their location in the city, and does point to a correlation between lifestyle choices and surrounding environment. However the most interesting aspect we uncovered is the lack of connection some people have to the city as a place — environmentally, socially, and culturally — when they live in the gigantic 'middle' zones far from central areas and the exterior fringe." Tempe, Arizona: Pyracantha Press, 2011. Edition of 30. 13.25 x 16"; 34 pages. Printed in handset Baskerville type on Somerset paper; with digital photos printed on Moab Entrata paper. Ledger bound in red silk and pinto lokta paper-wrapped boards. Signed by the three artists. Numbered. Claudia Smigrod is a Professor of Photography at the Corcoran College of Art + Design. 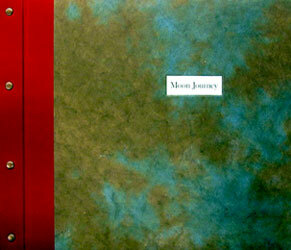 "Moon Journey" is a collaboration with her two sons Sam Dingman, musician and actor, and Jake Dingman, writer. Each volume includes Claudia Smigrod's 17 pinhole photographs digitally printed, complemented by embossments and by text written by Jake Dingman. 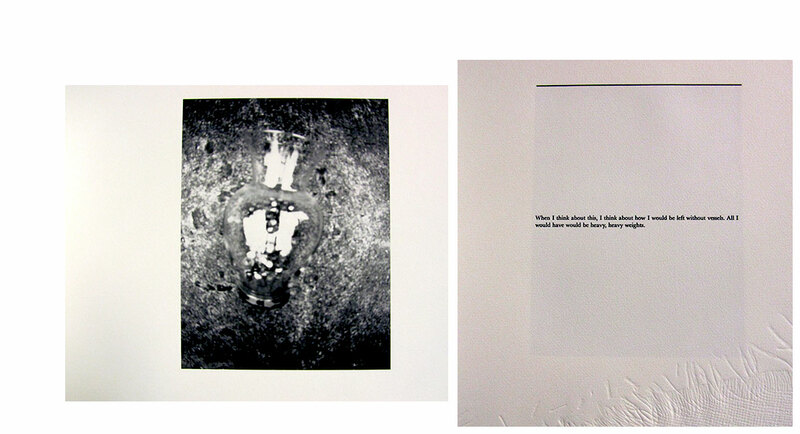 A compact disc presented on the colophon page offers music composed by Sam Dingman that responds to the text and photos. 5 x 7” closed; opens to 7 x 42”. Letterpress printed from handset Palatino and Neuland types with digital Bernhard Gothic and scanned plant forms from polymer plates. A CD of the song cycle is included. The Deluxe Edition was printed on five papers handmade at the Press from over forty fibers sent by papermakers from around the world. 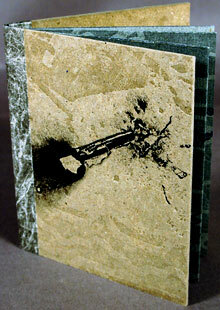 It is housed in a hand-constructed paper slipcase. The Standard Edition is printed on recycled French Speckletone and has a slip sleeve. Signed by the composer. A song cycle composed by Dimitrije Buzarovski using texts by Chief Dan George, Gerard Manley Hopkins, Stevie Smith, Alfonsina Storni, Li Po, and the Book of Job. 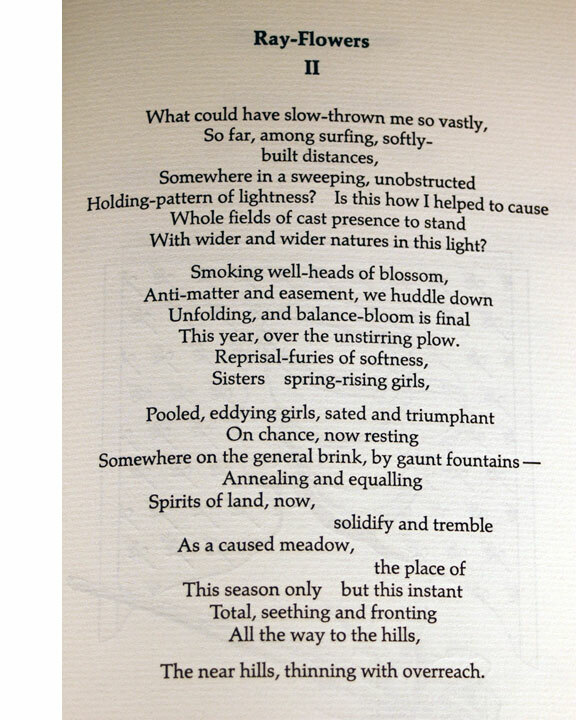 Aware of Buzarovski's cycle Songs of Peace and War (1994), mezzo-soprano Nan Hughes came across a poetry anthology on man's relationship to the environment. At her urging, Eco Songs became the Macedonian composer's next project. Six selected texts soon became a sequence which suggested sounds and music. 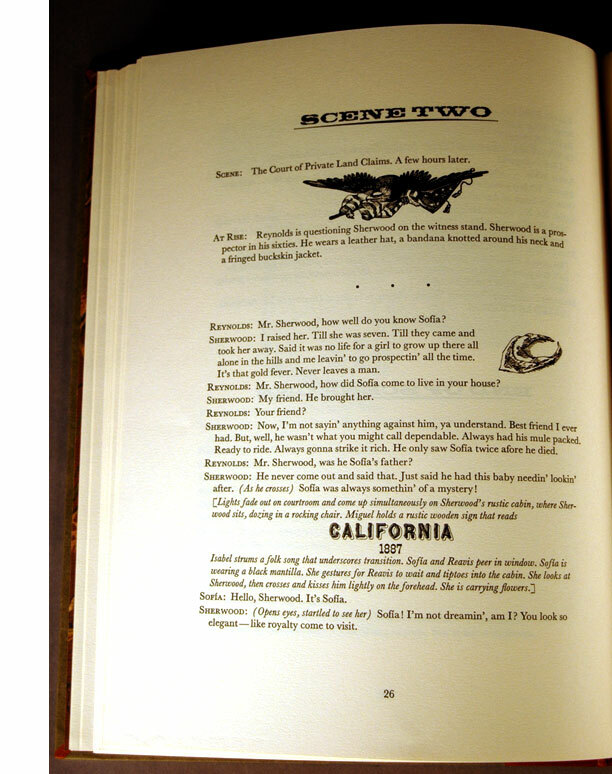 The book contains three sections, the main comprised of the accordion-fold display of lyrics represented in visual typography. 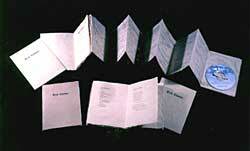 The foremost section is a codex of the poems as originally written sewn into the first fold. A concluding codex sewn into the last fold includes information about the poets, composer and singer, plus a colophon about the making of the book. 5.5 x 4.2" closed; 5.5 x 17" extended. The boards have been treated with motorcycle tire thread embossments and Xerox transfers of exploded bottle rockets. Printed in 21 runs with 17 from polymer plates and 4 letterpress relief runs. 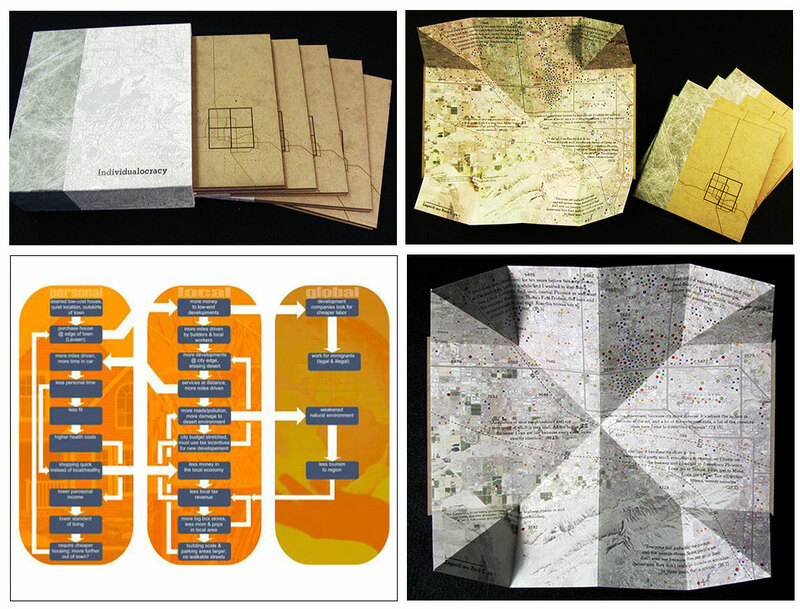 The origami sheet is sewn onto dyed tyvek strips and attached into archival binding boards. A collaborative artist's book designed and printed by Dan Mayer in collaboration with Mary McCann, The Bone Mama, performance poet and deejay. 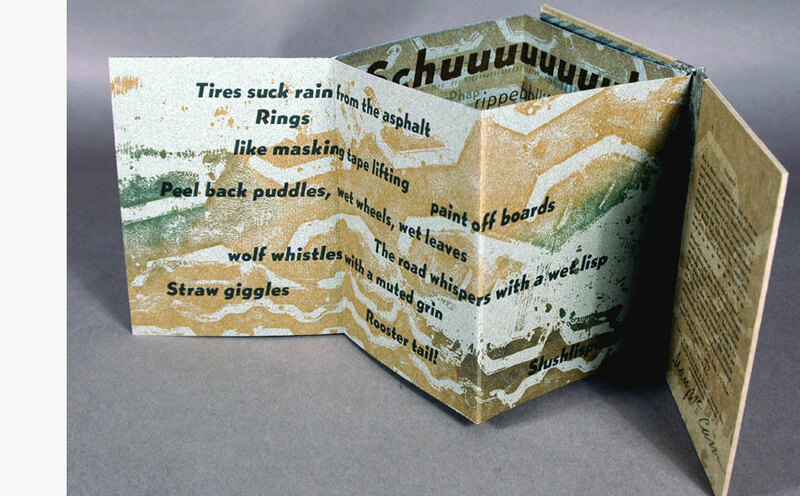 A two-sided origami bookform contains two new sound poems by McCann presented through visual typography and shaped texts. One sound poem embodies the noise of motorcycle tires hitting wet pavement in Arizona and in the other a lone bottle rocket takes off and returns. Tempe, Arizona: 1985. Edition of 120. 9 x 12"; 64 pages. Handset Baskerville type on Rives Lightweight paper. Includes twenty-two lino cuts of the period and a foldout map. Decorative endpapers. Bound in boards with a leather spine and gold title. Designed and printed by John Risseeuw. Prospectus: "In 1805, James Addison Reavis nearly perpetrated the largest land fraud in United States history: the infamous Peralta Grant, covering over sixteen thousand square miles of Arizona Territory. For more than ten years, Reavis produced forged documents to support his claim to a fictitious Spanish land grant and in the process convinced hundreds of lawyers, farmers, ranchers, and even the Southern pacific Railroad that his wife was heir to a parcel of land twice the size of Massachusetts. “The Last Baron of Arizona is a play about the Peralta Grant hearing in the Court of Private land Claims. Through numerous flashbacks, the complete tale is told. It is a lively story with colorful Southwestern characters, all the more interesting because it is true. "This first edition of The Last Baron of Arizona was produced at the book arts press of Arizona State University, the Pyracantha Press, to contribute to that school's Centennial celebration." The play was first presented by the Arizona State University Department of Theatre at the Lyceum Theatre, March 2, 1984. Tempe, Arizona: 1985. Edition of 150. 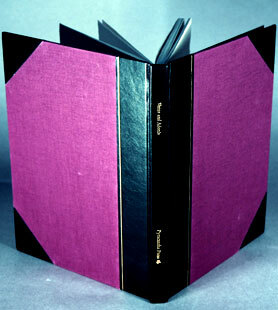 7.25 x 13.5" quarter-bound in leather and natural cloth. Printed in two colors on Arches Text Laid paper. Three line illustrations and the "Puella" title drawn by Brenda Bodney. Designed, set, and printed by John Risseeuw. Prospectus: "... James Dickey's collection of nineteen poems which form a record of a woman's coming of age journey, from childhood to adulthood. The book is based on the life of his wife, Deborah, and was written as a gift to his daughter, Browen. Before publication in book form, the works had already been awarded the prestigious Levinson Prize from Poetry magazine. 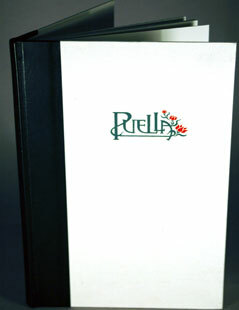 "In 1982, the world premiere of Puella was given at the Arizona State University Kerr Cultural Center. This production of literature translated into fine arts performance was directed and produced by Dr. Janet Larson McHughes of the ASU Department of Communication. Staged with original music, choreography and set design to complement the oral interpretation of the poems, the Puella production was a beautiful showcase of the best of the performing arts. "To complete the fine art involvement with Puella, the book arts press of the ASU School of Art, the Pyracantha Press, was chosen to produce a limited edition of the text....The text was handset from Mr. Dickey's original manuscript ...."
Tempe, Arizona: 1984. Edition of 120. 8.25 x 11"; 76 pages. Paper handmade at the HMP papermill in Woodstock Valley, Connecticut. Type is Monotype Bembo, machine set and reset by hand in the shop. Printed in three colors throughout. Bound in half-leather and dark maroon linen over boards. Designed and printed by John Risseeuw. "An effort has been made to reflect something of the first edition in this new limited edition. 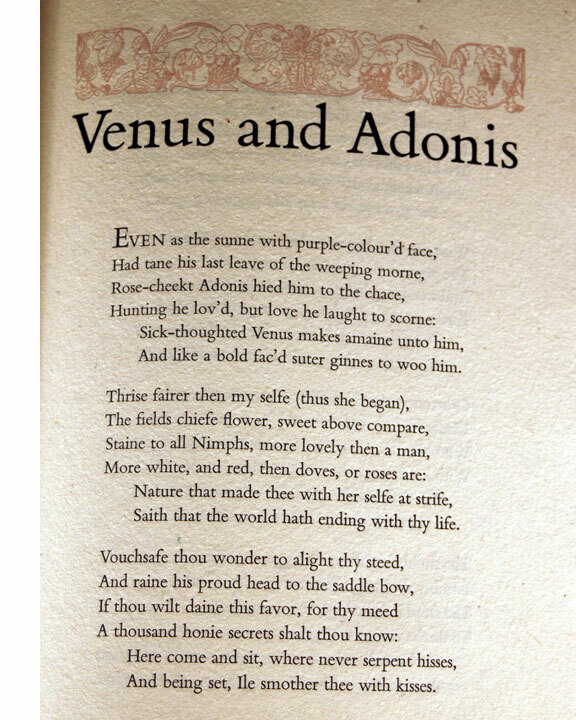 Through choice of paper, typeface, ornamentation and design as well as through the fidelity of the text in an 'old-spelling' form, the event of Shakespeare's first appearance in print is interpreted for the modern reader."